Located in New York City’s Flatiron design district, Iliad specializes in luxury antiques and bespoke furniture inspired by early 20th-century design—Biedermeier, Art Deco, and Art Moderne. Filled with artwork and furniture masterpieces, Iliad looks more like a fine art gallery than an interior design studio. Co-founders David Charette and Andrea Zemel launched the company in 2001 to revive a lineage of furniture design techniques that have been nearly lost in the United States. Their team resurrects bygone interiors using the forward-thinking technology of 3D printing. Iliad’s New York City studio is filled with beautifully restored antiques and bespoke furniture. The hardware on this sideboard cabinet was printed with the Form 1+. Iliad fuses traditional craftsmanship and new technology to recreate early 20th-century hardware. For each bespoke piece, a designer first sketches an idea by hand, continuing a long tradition of furniture-making that begins and ends in the artist’s hands. They reproduce this sketch digitally and use the Form 1+ to print a highly detailed model. Lastly, they cast the piece in brass and rework the metal fixture, bringing out the piece’s intricate features. Because the creative process has remained in-house, the Iliad team can produce hardware quickly. Based on client feedback, the design can be easily changed and reprinted in just a few hours. This efficient process allows them to focus more time and energy on perfecting their designs by hand. The Form 1+ produces a detailed model (shown with supports) that is later cast in bronze. After casting the hardware in bronze, an artisan reworks the fixture by hand and adds it to the bespoke piece of furniture. 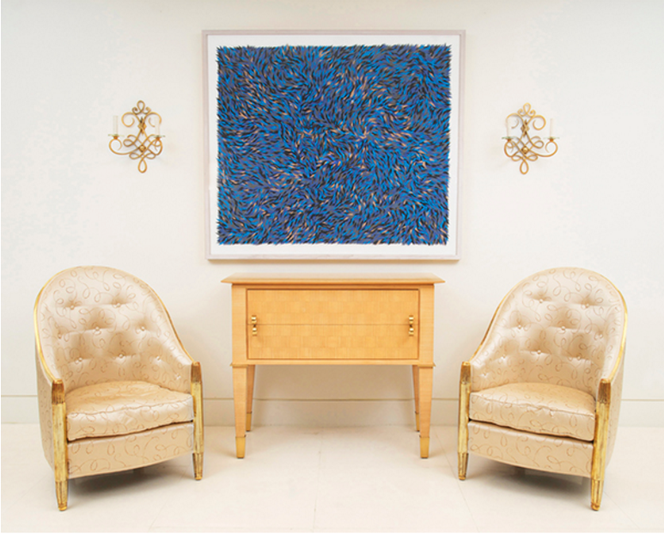 Iliad’s luxury furniture attracts clientele and art collectors across the world. The team has collaborated with renowned designers, including architect Robert A.M. Stern. “Our business has evolved a great deal from our early days relying on old-world techniques,” Andrea says. “Cutting-edge technologies have greatly enhanced our capabilities to design and innovate new furniture forms.” The Iliad team looks forward to many more years of innovation, using new technology to bring past interiors into the present.